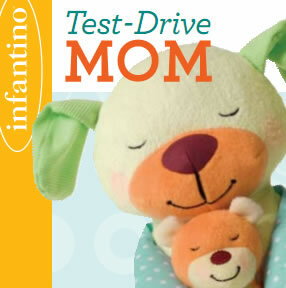 When Infantino sent me their Sync Carrier, I was a little skeptical. I had never used any kind of wrap before. Just looking at it made me a little nervous. After watching the instructional video and practicing a couple times, I was ready to try it with Stella. I highly recommend watching videos. I live in a small town. It's hard to find another baby wearer, let alone an expert to hold instructional workshops. 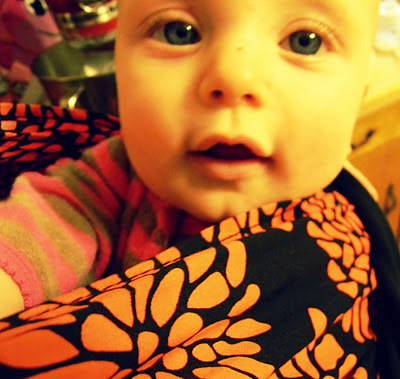 I have relied on YouTube to learn to use all of my baby carriers. I only used the Sync for a front, facing in hold. It was fairly easy and very comfortable. All of the weight was equally distributed and the large area covered by the wrap contributed to the comfort. After a while, though, Stella seemed to sag a little and I never could get her quite tight enough or high enough. Perhaps more practice will remedy that. Normally, I use a ring sling or a structured carrier when I wear Stella. I do prefer those to the wrap, mostly because they are easy to use and I can get them on quickly when we're out. Also, the color/pattern on the Sync leave a lot to be desired (it's true, I am a little vain). All in all, though, the Sync Carrier isn't bad. I'd prefer to use it with a newborn baby and wish it wasn't so loud. It is very comfortable. You can learn more about the Sync Carrier here and watch the instructional video here. They are available for purchase at Amazon. You can find Infantino on Facebook, Twitter and YouTube.